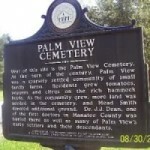 This is listed on several paranormal websites as a “haunted location,” but without a single story to back it up. If you happen to know of anything odd that’s happened here, please let us know. Otherwise, as far as we’re concerned, it’s just a normal graveyard! we used 3 pieces of equipment here, 2 digital records, an ovilus 5 and Paranormal puck 2. We had some pretty interesting experiences here. we came into the grave yard on the 61 st side. We took an immediate left and walked to the fence. The Ovilus 5 gave us 3 words right off the bat – data, rocket, below. I am trying to find out more about this info. When we came back where we started we found a childs grave that had mown grass all over it and numerous toys and dolls. We place the hot wheels truck on her grave. We then took out the paranormal puck 2 and started asking questions. We received some responses that at first did not make any sense. Upon further investigation however, the responses seem to be intelligent and residual. Using the puck I got the following responses in this order, names Tom and Don as well as acknowledgement of “indirect company” and “men hours talking”. This is where it became fun. the next responses i will put in one list. ” SEE JAPANESE FRIEND KILLED PIERCE ROUND WHITE”. It was then that we noticed we were standing right next to a world war II veterans grave. Pretty freaking cool. The Puck is new and I am new using it. I am adding the text from the Puck on here. I think I was asking the questions too fast, when I asked how old he was, he says produce stones jerk lol. I will return here when I am used to the puck alittle better but it is worth checking out. User:	how old are you? User:	what is your message? User:	who do you miss? User:	did you hate the war?